Cape Town - New Zealand captain Brendon McCullum acclaimed the bowling of Vernon Philander and bemoaned his side's performance after they crashed to 45 all out on the first day of the first Test at Newlands on Wednesday. Philander took the first five wickets as New Zealand were bowled out before lunch after winning the toss and batting on a well-grassed pitch. That the surface contained no real demons was shown as South Africa reached 252 for three, a lead of 207, by the close, with Alviro Petersen making 103 not out. "It's a bitterly disappointing day," said McCullum. "It was a poor batting performance coupled with an outstanding bowling performance. 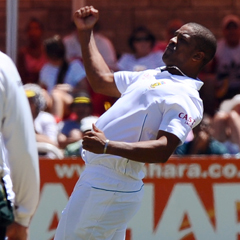 The spell by Philander was as good a spell as you will see in Test cricket. He never missed his length, he asked questions in terms of defending the stumps and managed to get the odd ball to kiss away as well. It was a world-class spell." Philander took the first three wickets without conceding a run and finished with five for seven as New Zealand collapsed to their third-lowest total in Test cricket and the joint 12th worst by any team. New Zealand, fielding a team hit by injuries and controversy, contributed substantially to their collapse with uncertain foot movement against Philander, who stuck to his tried and tested method of bowling in a tight channel at a lively pace, able to make the ball deviate in either direction. McCullum admitted: "We weren't anywhere near where we wanted to be with the bat." Asked whether he had considered bowling first on his first day as Test captain, McCullum said: "I definitely thought about it. I had a long, hard look at the pitch yesterday and again after it was cut this morning. "I thought it had reasonably even grass cover but it was reasonably dry and there were a few cracks there as well. It was going to be challenging for the first little part but not ten for 45 challenging." Philander said there had been help from the pitch but it was nothing unusual. "There was moisture out there and at Newlands there is always something in the morning with the new ball on day one. We bowled well and got the ball in the right areas. It happened quite quickly." Hashim Amla made 66 and Jacques Kallis became the fourth man to make 13 000 Test runs on his way to scoring 60. Kallis concurred with Philander's opinion about the pitch. "Our bowling was phenomenal," he said. "There wasn't too much wrong with the wicket." South Africa needed only 12 overs to take a first innings lead. Philander took his five wickets in the space of 20 balls, starting with Martin Guptill, who was caught behind off the last ball of his first over. Morne Morkel took three for 14 and Dale Steyn two for 18. Although the pitch gave some help to the fast bowlers, South Africa's free-scoring reply showed there was nothing untoward in it. Captain Graeme Smith was leg before wicket to Bracewell for one to become the eleventh man dismissed before lunch, which was taken at three for one but Amla and Petersen shared a second wicket stand of 107. Kallis then helped Petersen add 104 for the third wicket. It was his ninth half-century at his home town ground to go along with nine centuries. He looked in total control before edging a drive at a ball from left-armed fast bowler Trent Boult which was slanted across him. When he went past 20 Kallis joined Sachin Tendulkar, Ricky Ponting and Rahul Dravid in scoring 13 000 runs in Tests.